From Gold to Green: Oops! Do you have the Starbucks app on your smart phone? I finally downloaded it to my phone just last week after having stopped at a Starbucks with a friend who had it. She was getting her free drink due to her Gold Card and I got intrigued to learn more about it. As many other big companies, Starbucks launched its loyalty card early in 2009. The idea behind creating a brand loyalty culture in a company is immensely valuable, as it guarantees customer loyalty and simultaneously gathers data of consumers, at the small cost of rewarding consumers with small gifts. In Forbes, Roger Dooley case studies Starbucks’ loyalty program and finds a misfire. Dooley talks about Starbucks’ magnificent marketing techniques and their great job in cultivating a brand loyalty culture. He says “Like the airline loyalty programs it resembles, the Starbucks Gold Card program has to deal with customers whose consumption habits change… if you must cut benefits, you’d like to do it in the most sensitive way possible”. It is not the way Starbucks has gone about creating, managing and marketing their Gold Card program, it is the way they have removed benefits from less frequent customers that could be revisited. As of now, when a customer frequents their coffee shops they accumulate points and get rewards in relation to their purchases. It only takes 30 stars to become a Gold Card member and to maintain that status, you must consume 30 stars on a yearly basis. If for instance, you open a card and for the first year accumulated 30 or more stars, you automatically become a Gold Card member. 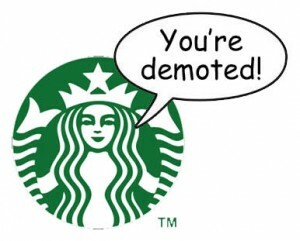 If the second year comes around and you fall short of the 30 new stars you were to achieve, Starbucks sends you an email informing you, in a rather cold way, you have been “demoted”. Even though it is relatively easy to get your status back, this same email will continue informing you that “you’re back to Green for now, and your Star count has been reset”. Therefore, you fall down in level and zero out in points, it is a lose-lose situation for the brand loyal customer. It is interesting to see who even though this app sounds like a great way to incentive clients to visit their Starbucks coffee shop, it also seems like a one-way street. I say this because it seems that as long as you are loyal to Starbucks, Starbucks will be loyal to you. Because the moment you do not accumulate the 30 stars Starbucks requires to be in the Gold Card, it is as if you have never been a loyal customer and you start all over again with a Green card and zero stars. Do you think it is right for Starbucks to simply zero out your account? What suggestions would you give to loyal customers who may feel frustrated? Do you have a Starbucks app? Are you a Gold Card member? What is your opinion? Our Experiential Learning Activity for week two of our Management 301 class was titled The Sky’s the Limit. We were divided into groups of 4-5 people with the purpose of assembling a high rise from spaghetti and marshmallows. Our group did a good job at following most of the rules, we selected a project manager (not me) and delegated jobs for each of our team members. Our project manager listened and motivated us throughout the 20 mins; one of our teammates was in charge of bringing the materials we needed and calculating we stay in budget; another two members (myself included) made the layout of our structure and worked together having in mind the same idea for the edification. Our last member did not contribute much, originally when we were planning the high rise she agreed with our ideas but her comments were a bit too soft and were not heard by all of us. We completed our structure that stood still and tall, but did not pass the quality test of holding 50 sheets of paper for 1 min. Looking back, we had a basic idea of the importance of layout strategy and project management, but we failed to use all of our resources to a maximum. We neglected the contributions and possible help one of our teammates could have provided. This project reminds me of my first project at work. I work part-time at my dad’s oil changing shops in South America over the summers. On my first day a couple of summers back I was introduced to our 90 employees at a training meeting. I was in charge of implementing a new software program we had just purchased in order to provide faster customer service at our locations. My role was to introduce each employee to the program and teach them to efficiently use the software. I was also in charge of redirect any technical errors to the software system’s offices in Pennsylvania via telephone. This endeavor had the mission of making all our staff comfortable with the new software. However, I could not reach out to each employee and teach them individually as we had a deadline of implementation, the company’s anniversary day that was the day we wanted to launch this new program at all of our shops. The way we laid out training was the software system’s agent, Chuck, who I worked with via tele-conferences, taught me how to use the program. In turn I taught each store’s manager, who was in charge of teaching his shop’s employees. Through delegation and a chain we got the knowledge of using our company’s new software system of operations from one person (Chuck) to branching it out to 90 plus employees. If we compare both projects I can identify a project manager, a completion deadline, an inclusive mentality and quality checks existent. The effectiveness of my job’s project in comparison to the failure of our team’s high rise may reside in the project layout structure, as the former counted with a planning team of office professionals and the later with classmates who were just introduced to operation management theories.